Constructed adjacent to a UNESCO World Heritage site, the new Palace of Justice in Córdoba, Spain delivers a contemporary take on the traditional courtyard typology and Moorish screening techniques found throughout the city. Led by Dutch firm Mecanoo and Spain's AYESA, the 51,000-square-foot super dense project was initially awarded after a competition in 2006, and after a long delay, it was designed and built from 2014–2017. The exterior cladding is responsive to large massing blocks that accommodate deep courtyard recesses for daylight admittance. These voids in an otherwise imposing monolithic block doubly function as spatial dividers for various internal zones serving civic, judicial, administrative, and institutional spaces. The resulting semi-public patio spaces offer up an opportunity for admittance of natural light and ventilation deep into the core of the block, where a central circulation “spine” runs. 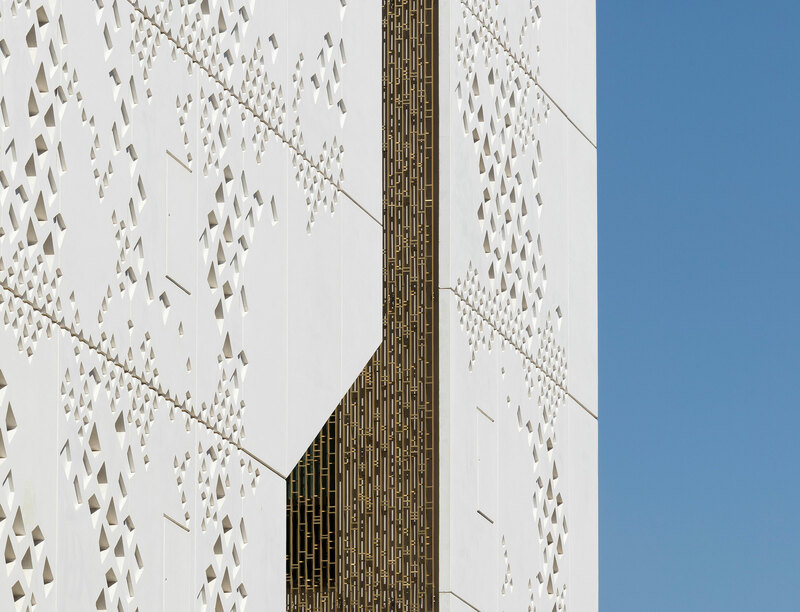 The cladding strategy is precisely coordinated with the massing of the building, relying on 33 versions of white glass fiber reinforced concrete (GFC) panels, articulated with a loose grid of punched window openings and recesses in the facade for texture. The depth of this system offers solar shading at glazed openings to help buffer the building’s occupants from southern Spain’s subtropical climate. A large cantilevered entry, and numerous courtyards, assist in the self-shading strategies of the building massing. A bronze-anodized aluminum lattice composed of vertical plates and horizontal tie rods clads the courtyard walls. These screens sit outboard of various window configurations to accommodate the office program beyond. While the Córdoba city center is located south-east from the site, the building volume was condensed to create a generous ramping entrance square to the north which connects the Palace of Justice with the existing Huerta del Sordillo gardens. The building contains a courthouse with 26 courtrooms, a wedding room, a Forensic Institute, offices, a cafe, an archive, a prison, and a parking garage. "One can say that the sustainability of the building is not achieved by expensive technological mechanisms but by an intelligent interpretation of the vernacular architecture," said Mecanoo, referring to the unique shaping of their building, in a press release. "The massing strategy creates urban integration through fragmentation. It follows a similar strategy to the spontaneous growth process of medieval cities resulting in a volume which is carefully sculpted to adapt to the surrounding context. This results in a puzzle-like structure which hints its process of formation and emulates the experience of the dense historical center of Córdoba." ﻿ Francine Houben, a founder of Mecanoo, will be delivering a keynote presentation at The Architect's Newspaper's (AN) upcoming Facades+ New York conference, a two-day event in mid-April focused on the design and performance of the next generation of facades. More information on the conference, along with registration details, can be found at facadesplus.com. “I want you to give me the problem that you think does not have a reasonable solution,” quipped Carol Ross Barney in her bright, two-story lofted space in Chicago’s River North neighborhood. No list of influential Chicago architects is complete without Barney’s name. The head of the eponymous Ross Barney Architects, Barney has become the go-to for civic projects throughout Chicago and the Midwest. In the past forty-plus years she has gathered over 100 design awards, including national and local AIA honor awards, the AIA Illinois Gold Medal, and most recently AIA Chicago’s highest honor, the 2017 Lifetime Achievement Award. Her office is filled with models and one-to-one mock-ups of projects ranging from public transit stations to million-square-foot airport facilities. At around 25 employees, the studio is very hands-on. “I just love the idea of making ideas and sharing them, and that extends to the studio,” Barney said. “In the past, we would trade concepts, you would work on a concept for a few weeks, and then we would trade projects.” The office is, unsurprisingly, filled with young architects, considering Barney has taught at either IIT or the University of Illinois Chicago consistently since the late- 1970s. She has also taken part in the AIA Chicago Bridge Program, which provides young ambitious architects with AIA fellows as direct mentors. “I was born into this role. I’m the oldest of eight children. I had a built-in responsibility,” Barney joked. “It has always been something that is very rewarding, but also fascinating to see the choices people make and why they make them.” CTA Cermak-McCormick Place Station Built to serve the largest convention center in the country, the station is built without disrupting train traffic on a narrow right of way. The station includes a perforated stainless-steel and polycarbonate tube, which provides protection from wind and rain while leaving the platform completely free of supports. Glazed masonry units and granite finishes on the interior allow simple maintenance, and the station replaces one that has been closed since 1978. Oklahoma City Federal Building Located just two blocks from the Murrah Federal Building, which was destroyed in a domestic terrorist attack in 1995, the design of the Oklahoma City Federal Building needed to acknowledge the memory of those who were killed while looking to the future. The 185,000-square-foot project was designed to maintain a sense of openness while adhering to the most stringent security measures. The building was created in collaboration with the Benham Group and Sasaki, with a water featured designed by Brad Goldberg. Lincoln Park Zoo As a new entryway for the country’s largest free zoo, Ross Barney’s design incorporates an information center and gate. Special care had to be taken in designing the gate, as standards for keeping animals in (in the unlikely case of an escape) are more stringent than those to keep humans out. Ross Barney produced numerous one-to-one mockups in studio as proof of concept for the ornately patterned portal. 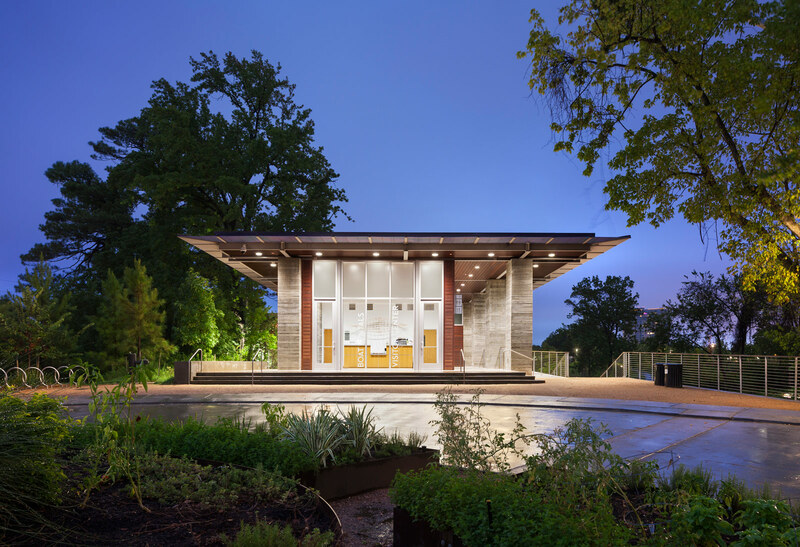 With operable walls, the information center can transform from an interior space to an exterior in pleasant weather. Chicago Riverwalk One of the most awarded recent projects in Chicago, the Riverwalk is part of a long-term effort by the city to enhance the public’s relationship with the water. In collaboration with Sasaki, Ross Barney oversaw the three-phase project, over the past decade. 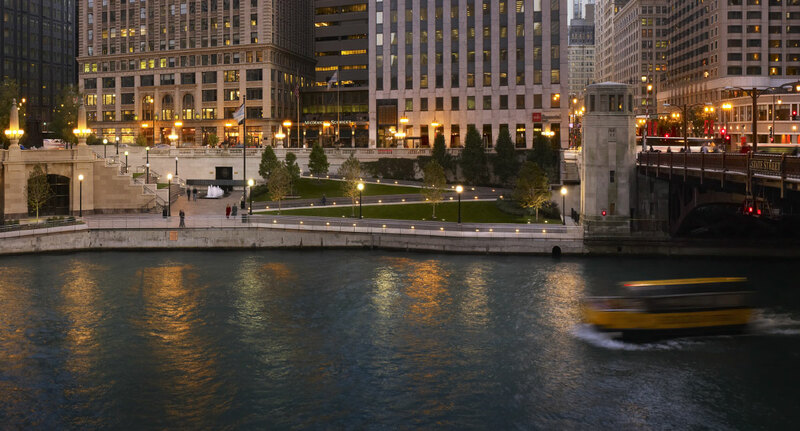 Comprised of multiple “rooms,” each section of the Riverwalk provides a different experience from a grand stair, to restaurants, and a Vietnam Veterans Memorial. Thanks to the success of the project, plans are being discussed to continue the Riverwalk further through the city. The Smithsonian National Museum of African American History and Culture (NMAAHC), scheduled to open to the public tomorrow, is capping off a nearly decade-long highly publicized planning and construction process. The 400,000-square-foot building is notable for securing the last developable site on the National Mall, and will be the nation’s primary home for exhibiting and celebrating African-American achievements in art, history, and culture. While 60 percent of the structure sits below grade, the remaining 40 percent rises 85 feet above grade and is wrapped in an arresting daylight-filtering screen referred to as a corona. 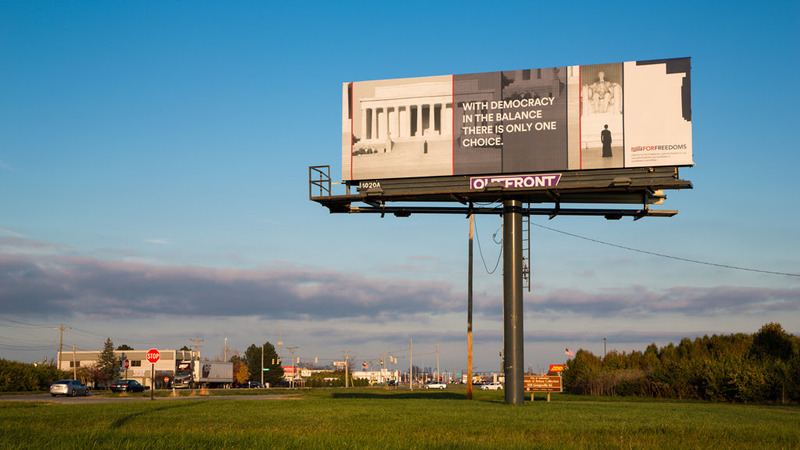 The three-tiered, inverted form merges African and American historical references, drawing from Yoruban caryatids and the Washington Monument. The corona’s pattern was developed by digitizing traditional shapes the team found in historic ornate ironwork from Charleston and New Orleans. The project is the result of a collaboration among Adjaye Associates, who functioned as the lead designer, Freelon Group (now Perkins+Will), who covered the interior design scope above grade, Davis Brody Bond, who covered the interior design scope below grade, and SmithGroupJJR, who was responsible for the entire enclosure of the building from the foundations to the roof, and from curb to curb. With four architects and numerous consultant teams on board, the NMAAHC’s design process was fast and highly collaborative. The client and representatives of each of the firms attended workshops and presentations at project milestones. Work on the facade design process proceeded with a smaller team coordinated by Adjaye Associates, who held regular meetings at its New York City office. For federally funded projects, three initial concepts must be presented before narrowing down to one final scheme. Only 14 months was allotted for the time between a final concept submissions to the delivery of bid documents. Areta Pawlynsky, partner at Heintges & Associates, the consulting firm for facade engineering, said this timeframe was pressing, but ultimately benefitted the project: "This was incredibly demanding, but in a way, easier to keep the momentum going to work through all of these design decisions.” Throughout this process, Pawlynsky said, adhering to the competition-winning design vision was what drove the design development process. "The most challenging part of the project was making sure the facades remained true to the competition." She continued, "When we look back at the competition entry images and the verbal description, we are very proud the building's envelope was able to remain true throughout its development. That doesn't always happen." With full height atriums on each of the museum’s four sides, the exterior envelope was conceptualized as an “inside-out” assembly, providing clear spans of glass to the interior. Guy Nordenson & Associates developed the primary structural system—a series of three horizontal trusses that wrap the building, giving the facade its signature tiered form. Construction detailing of the envelope was carried out through a design assist package awarded to a joint venture between Enclos and Northstar, who developed a cost-saving strategy to integrate vertical trusses within the curtain wall assembly. Heintges & Associates then engineered and developed technical options for systems that attached to this structure, including the screen panels and unitized glass panels. 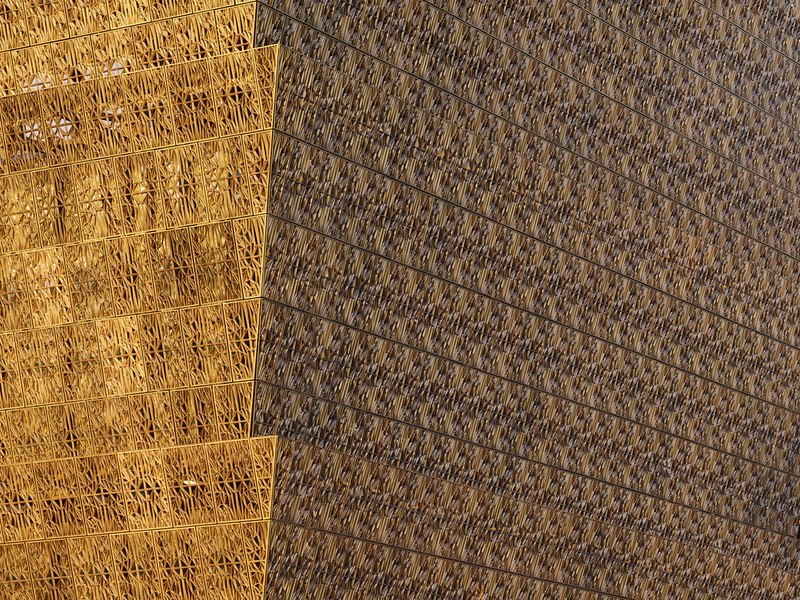 Adjaye Associates’ decorative screen pattern was digitally manipulated—scaling up and down to produce four densities ranging from 65 to 95 percent opacity in response to key views of the surrounding monuments, and to solar orientation. Selective openings in the corona screen provide “lenses” looking outward to key views of the Washington Monument, Lincoln Memorial, Jefferson Memorial, White House, and U.S. Capitol. The material selection process for the corona screen began with solid cast bronze, which was deemed too heavy with a variation that—over time—would cause undesirable performative and maintenance issues. The design team settled on a cast aluminum due to the material’s track record as a reliable cladding. A unique five-coat application of PVDF produced variation and depth to the bronze coloration of the panels. The corona screen was assembled on-site from shop-fabricated steel plate carrier frames containing 13 cast aluminum panels each. A staggered paneling running across the facade required selective panels to be installed in the field. These “stitch panels” bridge the gaps between adjacent carrier frames, helping to conceal any visual clues to the pre-fabricated frame assembly. The design team consulted with Fisher Marantz Stone on a subtle lighting scheme to incorporate backlit panels that bounce light off frit glazed walls to produce a glowing facade at night. These details and lighting effects were scrutinized through numerous design studies and mockups, and by regulatory agencies to ensure the lighting of monuments at night would remain balanced. Hal Davis, senior vice president at SmithGroupJJR, said the building envelope design was “quite unusual.” Asked if there were any technical challenges associated with designing a curtainwall system with an inside-out weather line, Davis replied, “of course!” He explained that an off-the-shelf-system couldn’t simply be installed backward: "It’s a different approach and it did take quite a bit of effort. We worked with Enclos and Heinges and David Adjaye to get it right and to make sure we were going to maintain the integrity of the design, the tightness and the insulation quality of the system, preventing condensation. For this, we had to develop very subtle heating elements that would eliminate moisture.” Pawlynsky concluded, "I think the real story of success here is the collaboration, including the contractors, Enclos and Northstar, and CM Clark. There was a strong commitment to executing this facade in the appropriate way, and it extended across the board." The building's pleated glass envelope contains 1,672 energy efficient panels that uniquely responds to its location. 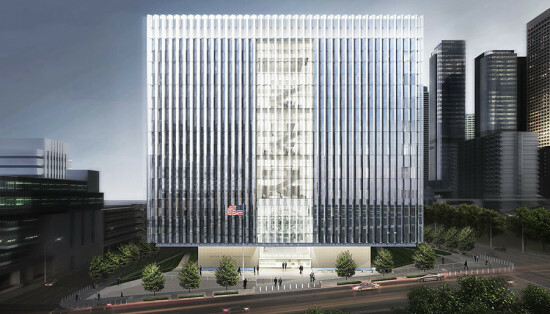 SOM has floated a glass cube above a large stepped civic plaza negotiating a sloped site in downtown Los Angeles for their United States Courthouse project, scheduled to open July, 2016 with an anticipated LEED Platinum rating. The 633,000 square foot, 220 foot tall facility includes 24 daylight-filled courtrooms and 32 judges’ chambers. José Luis Palacios, Design Director at SOM Los Angeles, says this structural configuration was integral to the success of the project: “Our challenge was how to make a transparent building, both metaphorically and structurally.” The project is being labeled as one of the nation’s safest buildings in regards to bomb threats and earthquakes due to an innovative structural engineering concept which allows a large volume of building to “float” over a stone base protected with hardened-concrete shear walls. The outer 33 feet of cantilevered building is suspended from a three-dimensional steel “hat truss” system, freeing the need for columns at the perimeter and ground level. The trusses are efficiently designed through an optimization process which resulted in a material savings of over 13 percent when compared to conventional trusses. After nearly a decade in the works, the renovation of Cincinnati's grand Music Hall has a construction timeline. 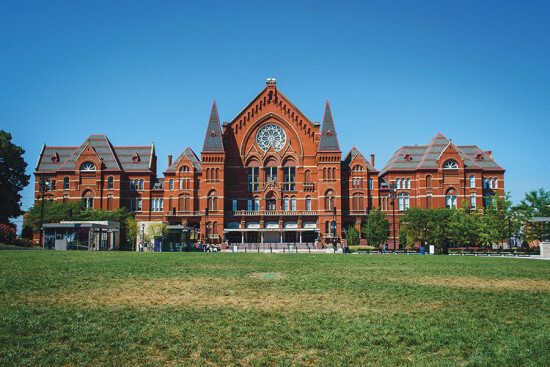 The $129 million construction project crept along for years, the building languishing while preservationists sought to raise funds for its restoration—even as the fortunes of the surrounding neighborhood of Over-the-Rhine surged. Music Hall landed on the National Trust for Historic Preservation's list of endangered historic places just months prior to receiving a critical $25 million Ohio Historic Preservation Tax Credit last year. Now, officials say, the 1878 landmark will shut down in June for renovations and reopen to the public in fall 2017. The Music Hall Revitalization Company still needs $6 million by January to close a lingering budget gap for the project, but MHRC board chair Otto M. Budig tells the Cincinnati Enquirer that a new wave of donors has him “confident that we’re not only going to raise that last $6 million, but maybe a few million more for an endowment.” Architects on the project include Washington, D.C.–based Martinez + Johnson Architecture, and Perfido Weiskopf Wagstaff + Goettel of Pittsburgh. Cincinnati Center City Development Corporation (3CDC) is the lead developer.